The Geze TS4000E Fig.1 is an overhead door closer which has electrohydraulic hold-open variable between 80 -180 degrees as per EN1155. The closer is able to be fitted to doors up to 1400mm wide due to its closing force which is adjustable between 1-6 as per EN1154. 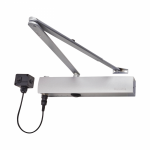 This is the main closer to be used mainly on hallway doors where it is desirable to have them held open throughout the day, but is able to close when the fire alarm is triggered to help stop the spread of fire.